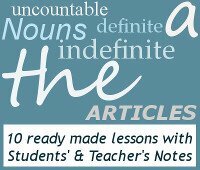 This is one of my free ESL/EFL downloadable comprehension lesson plans. What would you do if you were an overweight insomniac with acne who was often slightly depressed? Would you go to the doctor? Would you experiment on yourself to try and resolve each of your problems? Seth Roberts asked himself these questions 25 years ago and chose the route of self-experimentation. Would you like to find out some of his conclusions and try them out for yourself? Steven Levitt and Stephen Dubner are 'rogue economist(s who explore) the hidden side of everything', and authors of the books Freakonomics and Super Freaknonimcs. This lesson is based on an article they wrote for the NYTimes, in which they examine the 'Accidental Diet', and ask if there is any value to self-experimentation. This is one of my free comprehension lesson plans, and is suitable for upper-intermediate, advanced and proficiency level students (B1, B2, and C1). This lesson starts off with some discussion for the students where they get to diagnose and propose some solutions for our poor, overweight, depressed psychology professor with acne. They have to imagine that they are opinionated doctors who have to reach a common consensus, so this should lead to some lively interaction and original proposals.